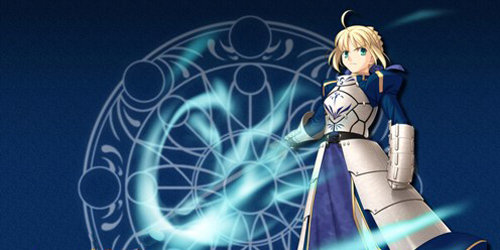 Ever wish that today’s JRPG’s could just hit the reset buttons on themselves and start over? Go back to the basics that made them so fun during the “good ol’ days”Â? Or perhaps you just wish the Final Fantasy franchise would go back to the way it was pre-Final Fantasy VII and see what would happen? Final Fantasy: The 4 Heroes of Light is here, and it hopes to grant those wishes for you. This title, new for the Nintendo DS, was made by the same team that brought you the FFIII and FFIV remakes in hopes of introducing you to a new adventure using some of the series’ more traditional mechanics. Does developer Matrix Software succeed in making what was old feel new again, or are they better suited to the remake department? One of the first things you’ll notice about this game’s tale is that it is also a throwback to a time when RPG plots were less convoluted. In fact, The 4 Heroes of Light‘s opening is almost identical to that of Dragon Quest III. Tell me if this doesn’t sound familiar: it’s the morning of your birthday, and as such, your mother wakes you and urges you to visit the king so you can begin your quest of adventure and manhood. 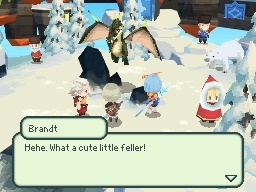 The main difference being that the main character, Brandt, is not the son of a great hero. In fact, they don’t talk about his father at all from what I recall. It always seems to be fatherless children that become heroes in these games. What were we teaching our children in the 90’s? Along the way, you will encounter three more unlikely heroes to join you on your quest. Jusqua, a fellow peer of your village, is stubborn and will give aid only when he feels like it. You’ll also enlist the aid of the princess of Horne, Aire, as well as her servant Yunita. As the story unfolds, the perspective will bounce around between these four characters as they will occasionally split into separate parties or follow their own path altogether, much like you could in Final Fantasy VI. However, unlike that game, the characters in The 4 Heroes of Light lack depth, and spend most of the game allowing their own immaturity to get them into trouble. Even if the characters themselves aren’t very interesting, sometimes you can get by if the plot itself is decent. The one presented in this title isn’t, unfortunately. 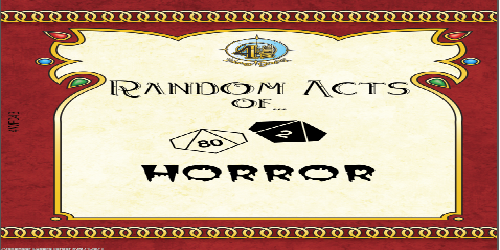 It’s a very run of the mill affair, starting off with your typical rescue the princess scenario which then escalates into saving the village from a curse. While your goal will inevitably change during the halfway marker, it still doesn’t evolve into a much more exciting quest and you will have to rely on the gameplay to keep driving you forward. Matrix Software went with a retro look when they designed this game, and it shows. By retro, I mean it looks like a first generation Nintendo 64 game. While the simplistic nature of the visuals add to the charm somewhat, I can’t seem to overlook how pixelated everything is. It’s not even a situation where you really have to study it to tell, as this was one of the first things I noticed about the graphics when I began playing this game. 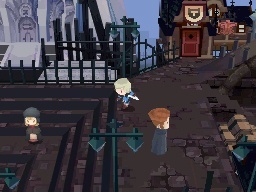 While the characters are consistent with what the artwork shows, figures with big heads and small bodies, the rest of the game isn’t as storybook as you would think it would be on the surface. It’s a shame too, because the potential was there to make this title look like a simplified version of the painted look you see in games like Okami. Unfortunately, if that’s what they were going for, the results turned out rather ugly. Even the landscapes and monster designs don’t fare much better. The presentations in both FFIII and FFIV blow this one out of the water by far. Unlike the Final Fantasy IV remake that preceded it, The 4 Heroes of Light does not contain any voice acting. This is fine, as given the simplistic nature of the story, I don’t think it would have added much to the experience. Also, given the sheer number of battles you will experience in this game, I doubt there would be enough variety in the victory cheers to keep you from going insane through the duration of the game. The soundtrack is decent, though no one track is particularly stand out and it pales in comparison to the previous works of Nobuo Uematsu. I did think it was a neat touch that the typical battle theme would play until one of your party members was almost slain, when it would then change to a different, more urgent theme letting you know that you better hurry up and heal your comrade. The same thing also happens with certain bosses; since you can’t see their HP, it acts as a musical queue, letting you know you’re close to victory. The sounds of combat lend themselves to the retro feel, as they sound like a throwback to older titles. Final Fantasy: The 4 Heroes of Light follows the same formula as many of the classic RPG’s that preceded it, such as other titles in the FF or Dragon Quest franchises. You visit towns, talk to all of the residents, and use their often cryptic advice to figure out what your next destination should be. More often than not, your destination ends up being a dungeon somewhere in which you’ll go to retrieve a particular item or rescue an individual. Repeat ad nauseam. 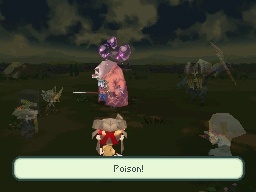 Battles also play out in your standard RPG fashion. As you roam around the map or in dungeons, you will encounter an enemy party and be taken to a separate screen focused behind your party. You have a selection of actions to take during the battle that play out in the order of who has the most agility. You and the monsters trade blows until one is defeated. Where this title separates itself from other RPG’s is the management of those actions. You see, all of your characters are given up to five action points, or AP. Actions such as Fight or Item cost one AP, and depending on what skills or magic you have equipped, those skills will cost anywhere between one to five AP to perform. You are automatically given one at the beginning of each turn, but should you need more, you have to use a skill called Boost in order to recharge your reserves. Success in battles relies on your ability to properly manage this system, as being too low on AP during a critical moment can cost you the fight. One feature of the battle system that seems to have more in common with the older DQ titles than FF is the inability to choose your targets. Whether you choose to attack, heal, use items, or whatever, you can’t choose who to use it on. The game chooses for you. 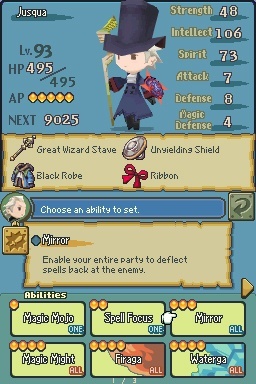 While this does limit the strategy a bit, this title does a fairly good job of choosing the best possible scenario for each one of your commands and it speeds up the the random battles, something you will be encountering a lot during your adventure. 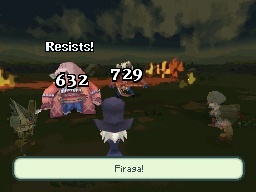 In fact, if you’re feeling really lazy, there’s also an auto battle function that you can enable as well. Adding another facet to the gameplay is the crown system. This is The 4 Heroes of Light‘s version of the job system that has been heavily utilized in other FF titles. As you progress through the game you unlock crowns that not only modify a character’s stats, but what abilities they have as well. They can even have an impact on the number of AP certain actions will cost. For example, a white mage uses one less AP for every white magic spell they have in their repertoire. Each crown can be upgraded up to three times using gems that are dropped from monsters in battle. While these upgrades didn’t seem to have a noticeable impact on stats, they do unlock more powerful skills that are inherent to that class, so it’s worth your while to upgrade your best ones. One feature that may detract from the experience for some people is the way the items are handled. Each character can only hold 15 items at a time, which may seem like a lot. However, each character can equip up to four pieces of armor which subtracts from that item count. So now, you’re down to 11. Then when you factor in that every spell is contained in a book that must be carried by that character in order to use it, you will soon realize that you not only lack the space for healing items, but for dungeon loot as well. You can store unused items at a shop in town, but if your inventory gets too full, the game won’t deposit your items automatically for you. Another odd decision involves how gil, the game’s currency, is acquired. You no longer receive gil from fighting monsters. Instead, you either have to sell the gems you acquire that are normally used to upgrade your crowns, or other items you may have picked up. There is a minigame you can play later on that involves running your own store, but this doesn’t come until later in the story. If the main quest isn’t enough for you, there are bonus dungeons that you have access to once you get near the conclusion of the game. You will need to achieve high levels to conquer them, but in doing so, you can obtain some of the game’s strongest magic, weapons, and crowns. In most games, doing these challenges will make the final boss a cake walk, but since its level scales with yours, don’t worry about it not being a challenge. The bonus dungeons aren’t the only things that will keep busy outside the main game. There are a number of minigames and challenges that you must do in order to acquire certain crowns. For example, only by earning 20,000 gil in the shopkeeping minigame I mentioned above will you receive the Seamstress crown. Since these crowns are entirely optional, it encourages more experimentation since you now have new abilities that you otherwise wouldn’t have had access to if you hadn’t worked for the hidden crowns. There is also a multiplayer component to The 4 Heroes of Light. Unfortunately, since it was local only, I was unable to try it out in time for this review. However, participating in this mode will earn you points which you can spend on new items and equipment. You don’t have to do the multiplayer to purchase these items, although you accumulate them faster if you do. Despite the game’s title of The 4 Heroes of Light, you find yourself using only one or two characters during the first half of the game. So instead of outfitting yourself with crowns that complement each other in battle, you end up settling for the ones that are the most self-sustainable and will use those exclusively until you reunite with your comrades. 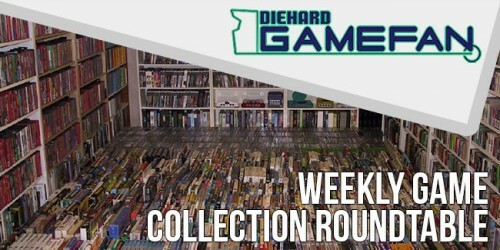 Once you reach a certain point in the game, you will be sent on item collection duty that sends you back around the world to places you’ve already been. All of the monsters will have been upgraded to much stronger ones, but you’ll be visiting some of the exact same dungeons you have already been through. Not only that, but since you can tackle them in any order, there is no sense of progression in the difficulty. The game actually gets easier as you find these items, because your characters are getting more powerful. Some of the crowns are ridiculously more powerful and useful than others, almost to the point of being game breaking. One of them, called the Elementalist, can buff your party to resist elemental attacks. The power of this skill is so ridiculous, that not only will it drop the damage to your teammates to the single digits, but the Elementalist will actually be healed by these attacks. Another crown, the Merchant, has an attack in which the level of damage is proportional to the amount of gil you have on hand at the time. Remember that shopkeeping minigame I keep mentioning? It makes you an insane amount of cash if you know what you’re doing. If you acquire enough gil to get you into the 100,000 and above range, you will be able to kill most bosses within a few turns. Now it’s your choice as the player whether or not you want to use these crowns, but it’s hard to overlook how much less frustrating some of the battles become when you use some of them. I also thought it was a shame that I never used some crowns at all because their usefulness wasn’t apparent to me. 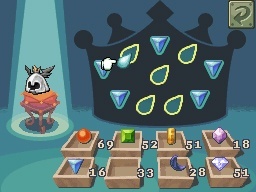 I think a better system would be to require all the crowns to be used in at least one major battle in order to encourage the player to experiment, rather than fall back on one formation for every fight. Final Fantasy: The 4 Heroes of Light gathers a lot of influence from not only its FF brethren, but it borrows heavily from Dragon Quest as well. In fact, it seems to follow the cardinal rule of “talk to everyone, and then talk to them again at night”Â that was so prevalent in the series. If you die, rather than having to load your previous save, you will get sent back to town with one type of your gems cut in half, another DQ tradition. Even the item management system seems like it was pulled right from that series. Despite the names of the crowns, there’s actually very little references to the series in the game. There aren’t any chocobos or airships, and many of the series monsters such as cactaurs and malboros don’t make the transition either. It’s FF in its simplest form and while it doesn’t hurt the game any, many fans may be disappointed to learn of their absence. Western RPG’s have been slowly rising to the surface in terms of popularity, but turn based JRPG’s haven’t gone away yet (the recently released Dragon Quest IX is a testament to that). That said, much of what you’ll find in The 4 Heroes of Light can be found in other titles in the market, though the approach is decidedly more old school in nature. It’s fun, just derivative. While not as thrilling as the older FF games when I first played them, this title still struck a nostalgic nerve that stayed with me up until the end of the game. It has its quirks, but still remains an enjoyable experience despite them. I had to walk away from it a few times during the instances where I was hopelessly lost and didn’t know where to go (this will happen to you on occasion), but I always wanted to come back to it and play more. As long as you enjoy older RPG’s, you’ll find something to like here. As I mentioned above, you really have to appreciate the old Final Fantasy and Dragon Quest games to garner any sort of excitement from this title. Unfortunately, as the years pass, more and more consumers are going to be of the flavor that started their RPG career with Final Fantasy VII. While there’s no problem with being that person, it becomes increasingly difficult for games like this to reach out to potential players because of its purposefully dated mechanics. It’s hard to go backwards in a series, and a title like The 4 Heroes of Light will likely get lost in the shuffle with its archaic visuals and simplistic design. Anytime you equip a new weapon or piece of armor, your character will physically change their appearance. The same goes for switching crowns, as the thing they wear on their head will alter based on which one you have equipped. 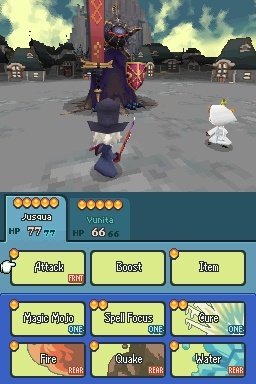 For example, a white mage will have a white hood on their head. It’s a minor detail, but one I found cool nonetheless. One thing that I did find inexcusable is the lack of a quick save function. Save points are fairly spread out throughout the game, and being a handheld title, not having some way to put the game down at the drop of a hat was a very unwise decision. If you intend to play this game while on the road or during a trip, be wary of this. Final Fantasy: The 4 Heroes of Light attempts to recapture the magic that first attracted fans to the series during its humble beginnings. However, due to the aging mechanics of the game, many people may be turned away by its uneven difficulty and item management system. If you can look past the game’s quirks, you will find an enjoyable adventure in the same vein as Dragon Quest and many of the other old school RPG’s that helped craft the genre as we know it. If you’re looking for originality, or even another portable adventure laden with a deep story and cutscenes, you won’t find it here. 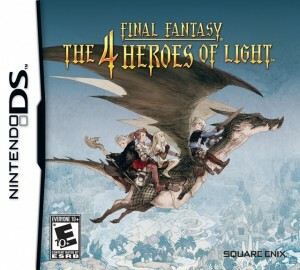 But if you want a solid, turn based RPG with its roots in the past, then look no further than The 4 Heroes of Light.